After Bobby’s first batch was bottled up, there was no turning back. He finished his business degree and went on to brewing school in Chicago and Munich, Germany. While in Europe, Bobby toured breweries in England, Belgium, Czech Republic and Germany for a closer look at how the world’s best breweries make their delicious beverages. Upon returning to Alaska, he joined the crew at industry pioneer Alaskan Brewing Company in Juneau. After a couple of years brewing Alaskan’s award winning beers Bobby moved into the laboratory to focus on quality control and recipe development. 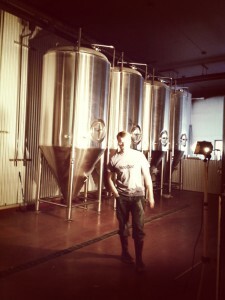 Bobby and his wife Jessica returned home to Fairbanks in 2011 to build their brewery. HooDoo Brewing Company is the culmination of a journey into the world of beer, and the brews available will be a reflection of this journey. Fresh, well made, craft beer – brewed in the heart of Alaska.